When it comes to spectrum debates, like the one happening now in Washington, policymakers and regulators pay a lot of attention to this idea of “beachfront spectrum.” This is the high-value spectrum that lives in the low-frequency band. Examples are the 700 MHz spectrum auctioned off a few years ago or the current debate over what to do with the 600 MHz spectrum about to be freed up in the incentive auctions. But while, low-frequency bands may be considered ideal today, advances in technology mean that the bulk of cellular traffic will be carried by higher-frequency bands. Essentially, technology will enable more beachfront spectrum. Trust in science. It’s worked before. However, a failure to grasp the advances that enable radio engineers to exploit ever-higher frequencies puts us at risk of oversimplifying discussions about the merits of different spectrum bands. And such a simplistic view means we could be engaging in inappropriate debates with respect to rulemaking for both the 600 MHz incentive auctions, consisting of relatively low frequencies, and higher-frequency government spectrum that may be reallocated for licensed use or shared in the future. The one constant in technology is progress. Consider that television UHF bands are called “Ultra High Frequency” because, at the time, engineers considered the frequencies extremely high relative to currently available radio capabilities. Today those same frequencies are the “low” band as referenced in debates about who should have access to what spectrum. Cellular technology has made similar huge advances in handling higher frequencies. Today’s 4G HSPA+, WiMAX, and LTE systems have reached the limits of spectral efficiency (bps/Hz) based on just modulation and coding — where the radio rubber hits the road. What’s next? Smart antennas, particularly Multiple Input/Multiple Output (MIMO), are the new frontier for expanding radio capacity, throughput, coverage, and cell-edge performance. With MIMO, radio signals can propagate through the environment along multiple paths, effectively creating simultaneous parallel transmissions. 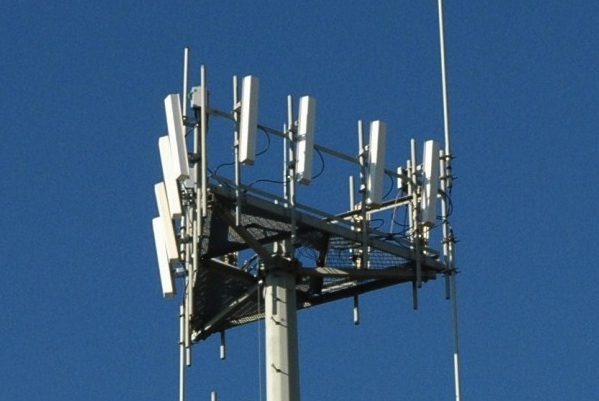 Most currently deployed LTE networks employ 2×2 MIMO systems, which have two transmit antennas at the base station and two receive antennas within the mobile device. Think of 2X2 as entry level in the MIMO world; operators are already gearing up for 4×2 MIMO deployments, with four base-station antennas. In the offing is 8×2; 8×4 would be even better, although a system with four antennas (and associated radio receive chains) is challenging to implement in mobile devices. But that’s just the beginning. The future belongs to massive MIMO, which involves dozens and, ultimately, hundreds of antenna elements at the base station. Significantly, massive MIMO systems are much more practical at higher frequencies – 2 GHz and up. That’s because antenna elements must be spaced based on wavelength; since low frequencies have larger wavelengths, they result in unwieldy and impractical antennas for physical towers. Massive MIMO was also behind May’s announcement by Samsung of a candidate “5G” technology, which would operate at an astonishingly high frequency of 28 GHz and use 64 antenna elements to deliver throughputs of 1 Gbps over distances up to two kilometers. Another aspect of spectrum discussion suffering from oversimplification is propagation. Yes, lower frequencies propagate farther; an operator can cover an area with fewer sites at 700 MHz vs. 1.7 GHz. Most cell sites, however, are deployed for capacity, not coverage: twice as many cells in a coverage area translates to twice as much capacity. That means the cells must be spaced more tightly, and thus an operator can use either low or high bands since propagation is no longer a concern. Deploying more towers does cost more, but operators have no choice if they want to deliver adequate bandwidth to all of their customers. In fact, the number of non-urban cell sites driven by coverage-only considerations is diminishing as operators are forced to keep adding sites to address capacity, even in smaller towns and along highways. Video streaming clearly does not stop at the city line. The benefits of lower frequencies are overstated — this spectrum simply is no longer beachfront property as commonly assumed. Yes, it definitely plays a role in a mixed portfolio of spectrum assets, but as wireless technology continues to improve, the higher frequency bands will provide the most capacity. Radio technology is on the move, and constraints that exist today will no longer apply tomorrow. Shape government spectrum policy based only on how technology functions now as opposed to its future inherent capabilities and we run the risk of future unintended, and adverse, consequences. Peter Rysavy, president, Rysavy Research, Wireless Technology Analysis. Just as long as you have that mixture of frequencies, I agree with you. You need low frequencies for coverage, high for capacity. Technology is still limited by physics. As mentioned above, lower frequencies propagate further–and penetrate buildings better. The biggest problem area isn’t rural, it’s suburban. You can increase tower density in commercial zones, but large residential subdivisions are difficult. Many people have good coverage while commuting and at work but poor, or no, signal at home. More capacity/bandwidth is all good, but we still need to work on coverage.